Created an important amenity for downtown and the only direct access point to the Willamette River. The riverfront park was a key element in the creation of the Downtown Waterfront Urban Renewal Area (DTWF URA). Since the implementation of the DTWF URA in 1974, assessed land values in downtown Portland have increased an average of 10.4% annually, from a total of $466 million to more than $1.6 billion. Before and after comparisons found 9.6% fewer vehicle trips on nearby roads and formerly connecting bridges. Over thirty years ago, Portland made the decision to raze the Harbor Drive freeway and replace it with a 37-acre park, making it the first city in the United States to initiate the idea of freeway demolition. The Harbor Drive freeway was a three-mile long, ground-level highway that ran alongside the Willamette River and provided a connection between an industrial neighborhood, Lake Oswego and areas south of downtown Portland. Built in 1942, the four lane highway carried 25,000 vehicles per day. 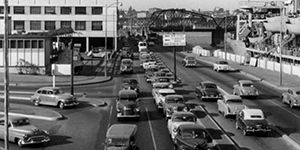 As the freeway construction movement gained momentum in the 1950s a number of additional facilities were planned for the Portland area. In 1964 the state completed the first freeway proposed under this plan, I-5, along the west bank of the Willamette River. Four years later in 1968 the State Highway Department proposed widening and relocating Harbor Drive between Front Avenue and the west bank of the Willamette River. However, by this time a movement to improve open space next to the waterfront had been initiated and the city’s 1968 Downtown Waterfront Plan recommended eliminating the Harbor Drive freeway and developing the land as a park to beautify the downtown riverfront. Originally, the task force did not even consider the option of closing the freeway, based on projections that the roadway would carry 90,000 trips per day by 1990. Under increasing pressure from the public and the governor, the task force revisited the issue and ultimately came to the conclusion that if the public was forewarned of the closure, traffic would adequately redistribute itself onto the network, and the freeway could be closed. The task force recommended closure and the proposal gained leverage when an alternate route, Interstate 405 was completed in 1973 and linked to I-5 by the Fremont Bridge. In May 1974, Harbor Drive was closed and removed to make way for construction of Tom McCall Waterfront Park. From the day of closure, no discernable congestion was recorded on surrounding surface streets. After the removal of Harbor Drive, there were minimal negative traffic impacts, partly due to the street patterns and traffic management of downtown Portland. In order to better manage traffic and more effectively utilize the street grid, all the streets downtown were converted to oneway and the traffic lights were signalized to enable vehicles to travel across downtown without stopping. The conversion to one-way streets was also accompanied by reduced speed limits in order to ensure a safe and friendly pedestrian environment as well as a bike-compatible environment. What were the benefits of removing Harbor Drive? Economic Development. The removal of Harbor Drive freeway was a catalyst in the redevelopment of Portland’s downtown waterfront area as it opened up direct access to the Willamette River and 73 acres of land, providing a greater potential for revitalization. In 1974, after the decision to remove Harbor Drive was made, the Downtown Waterfront Urban Renewal Area (DTWF URA) which covers 309 acres was established. The implementation of the DTWF URA in conjunction with the creation of the Waterfront Park enabled the City of Portland to promote development around waterfront amenities that also had positive economic impacts within the city as a whole. Working with citizens and businesses, a number of projects have been successfully implemented, providing additional tax revenue for the city, helping encourage growth, and transforming the downtown into a vibrant place. In addition to providing a public good and improving the quality of life for Portland residents, the creation of the Waterfront Park and subsequent DTWF URA has produced measurable financial benefits for the city. Reduction in Crime Rates. The redevelopment of the waterfront area also had impacts on reducing crime rates. According to police bureau reports, since 1990 crime has declined by 65% in the waterfront area compared with a reduction of 16% in the city as a whole. This is partly attributed to new visibility and to the increase in pedestrian “eyes on the street” in the area.